The Thermacell Mosquito Repellent Lanterns effectively repel mosquitoes, black flies, and other biting insects by creating a 15 x 15-foot zone of protection for bug-free comfort. Their ambient light and decorative design perfectly adorn your deck or patio. 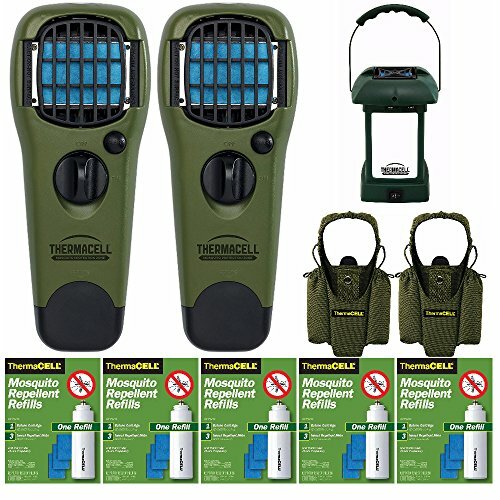 The Thermacell Mosquito Repeller system refills effectively repels mosquitoes, black flies, and other biting insects by creating a 15 x 15-foot zone of protection for bug-free comfort. Ideal for use while you are camping, hunting, fishing, gardening, and around the backyard, Thermacell products have been evaluated by the EPA for safety and effectiveness. The Thermacell Mosquito Repeller effectively repels mosquitoes, black flies, and other biting insects by creating a 15 x 15-foot zone of protection for bug-free comfort. Ideal for use while camping, hunting, fishing, gardening, and around the backyard. The Thermacell Oliver repellent holster allows you to carry your Thermacell mosquito repellent device when you're camping and hiking or exploring the outdoors. This holster features storage space for butane cartridges and repellent mats.